What can livestock producers do to defend their industry from the increasing challenge presented by militant, farm invading anti-meat activists? Supporting the representative groups that are fighting for them isn’t a bad place to start. Farming groups in Australia, primarily led by volunteers, now find themselves in the unchartered territory of trying to determine how best to defend the industry in the face of increasing and disturbing new tactics by animal activists involving mass farm invasions and live-streamed harrassment of family farmers. 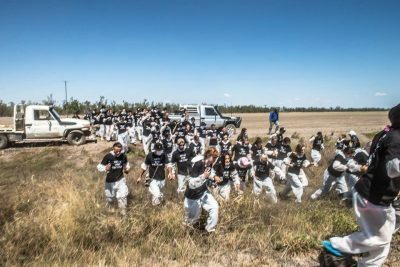 Even bigger protests than the recent invasion of a Queensland feedlot by 100 or more activists are expected soon (social media posts indicate this Monday, April 8, is a likely date), as offenders are emboldened by an apparent lack of legal consequences for their intimidatory actions. Meanwhile the groups trying to defend family farmers from such attacks are operating on a shoestring budget, largely because the majority of producers in Australia choose not to be paying members of their relevant state or national farming organisations. In effect their ability to fight is being undermined by many of those they are fighting to protect. When farm leadership groups lobby for agriculture they do so for all agricultural producers, not just those who support them with annual membership fees, and any benefits they achieve are shared by all farmers, including the many who don’t pay to support their work. The ‘free rider’ issue is “a classic problem” in Australian agriculture, as former Australian Farm Insitute director and current ACCC depty chair Mick Keogh told the NTCA conference last Friday afternoon. NTCA president Chris Nott said he was shocked when he first visited Canberra as a new industry representative several years ago and discovered how poorly resourced the Cattle Council of Australia was. Australia’s grassfed cattle industry produces more than $10 billion worth of economic value each year. But the peak industry body trying to represent that industry’s large and diverse interests is required to do so on meagre annual budget of around $1 million a year. For some important context, compare that to the annual operating budgets of the various animal welfare and rights and enviromental organisations operating in Australia, according to the Australian Charities and Not For Profit Commission website: the national and state arms of the RSPCA have a combined annual income in excess of $180 million per year; the World Wildlife Fund over $28m, the Australian Conservation Foundation $13.9m, Animals Australia more than $9m and PETA Australia $1.8m. With well-resourced and increasingly confrontational campaigns only likely to escalate in future, agricultural leadership groups need all the support they can get. How much better equipped to fight would our farming organisations be if every producer around Australia contributed to the cause? Producers will have their reasons for not supporting their relevant farming bodies, but, whatever those reasons are, now would seem as good a time as any for producers to re-engage and give the farming bodies that represent them another go. 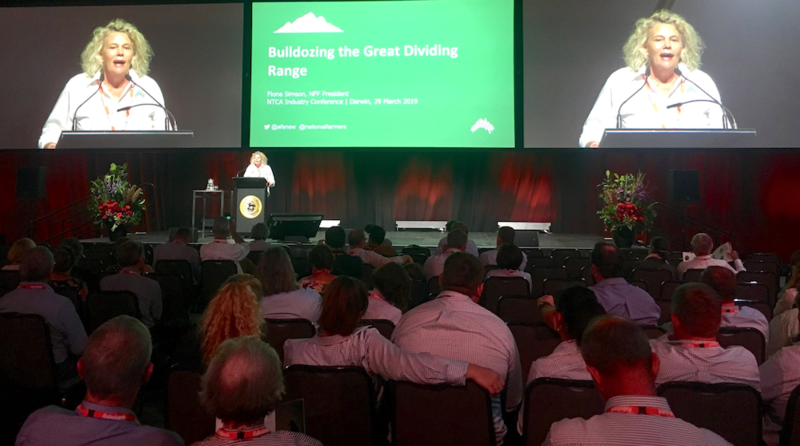 National Farmers Federation president Fiona Simson told last Friday’s conference that as activist campaigns increase, it is now “more important than ever” for all of Australian agriculture to stand as one and speak with a strong and united voice. Whether the groups trying to defend agriculture’s interests against increasingly militant anti-meat activists will have to do so carrying the weight of free-riders, or will be empowered by more producers willing to join the fight, could make all the difference. Paul, I read it as an article about why producers should support peak councils. There are many reasons why the current situation should not be the only catalyst for doing so. You and I might differ on how to approach the current issues but surely they need addressing? I will take issue with your statements around representation. We are currently going through a review of the Red Meat MOU, this is a worthwhile exercise, because a lot of what you call poorly thought out Australia wide mandatory policy has in most part resulted from the organisational structure put in place in the current MOU. The red meat industry has some 90 odd committees that make decisions that affect the whole supply chain. I would have thought that at least producers would expect that they would be represented by people with so-called ‘skin in the game’. I can tell you from personal experience that it is a daunting proposition to walk into an external committee room in which you are faced with people that have in some cases decades of experience, that being said the intention is never to implement anything without careful consideration and robust discussion, I would disagree that these policies are poorly thought out. As far as regulatory burden goes I would agree that we must see a return on these, our standards are said to be World leading, yet market access is a continual issue with a complexity that is often challenging. Take the EU for example, it is our highest price point export market. I am personally aware of the regulatory burden of being a producer of stock that are eligible for that market, I know producers in competing countries are not faced with the same standards of accreditation. Their supply chains are also not faced with the burden of regulation that ours is, and yet our Hilton HQB Quota share is 7500 tonnes, whilst there are upwards of 90000 tonnes of no-tariff/no quota Euoropean pork coming into this country that is in direct competition with our beef product at a domestic retail level. Now I understand there are opportunities for us to expand our beef exports into the EU with a favourable FTA, I am also lead to believe their bureaucrats are continually pushing for higher welfare and environmental standards among other things. Now Paul, this is the dilemma, what would you have industry do in this situation, because although I am often frustrated at our level of what you call paper work schemes, I am certain I would take ours over what in some cases is expected of some EU member countries producers? Now this is an issue that would usually keep me awake at night, this weekend I am sure there are many lying awake with the dread of thinking they may well be targeted by these extremists groups, there is apparently information on what areas are to be targeted. These people are doing something that is much worse than marching in the streets, and it is no longer just about live export. David I read it as the article is mostly about why producers are not seen to be supporting our peak groups. I give a reason why, the creation of poorly thought out Australia wide mandatory policy for all graziers contributing to their feelings of disillusionment and alienation. I have heard in the world of politics a similar thing is possibly causing the rise of some political parties. Where are the reasonable people questioning the Australian beef producers attitude towards animal welfare? I have not seen them marching in the street. Yes I have seen them marching against live export, but that is nothing to do with the producer and his method of breeding and growing animals. All I see are a minority group of activists whom from what I understand are trying to shut down the entire industry because they believe any farming of animals is wrong. They consider any farming of animals is a welfare issue. So cattle grazing in a paddock is a welfare issue to them as they will eventually be consumed by people. Any argument to counter them is like a religious argument, as as far as I am concerned their argument is not based on logic and reality, and to be honest the opinions they hold are such because they can afford to hold such opinions, such is the wealth of Australia today. They do not have to worry about things like drought or floods or starving calves like we have to. 9 out 10 farmers have walked off the land over the last fifty years and their children now stand on the other side of the fence crying with their obese mouths full. 2 years ago only 1 in 3 sheep farmers were profitable and no one helps them because they all think farmers are rich. Seriously, this is an article about animal activism and the first response is that producers will not support the Peak Industry Councils because of silly decisions made in the past. “Take CCA for example. Apparently out of the blue, animal welfare suddenly became an ‘issue’. So what was the response of CCA?” Again I might ask, is it really the case that producers believe that this decision was made by CCA alone? Then to go on and state that ” It was not go out and tell these people going on about welfare(……) that Australian producers for the most part do the right thing. Having seen the footage of the dairy cows in Sri Lanka, I would suggest that even if for the most part the animals in that program have been treated appropriately it is unlikely to make much difference, because obviously the news agencies involved are maintaining an expectation of journalistic integrity. We are most likely past the point where something has to happen as far as countering the negativity currently being portrayed widely about our industry. The pressure coming our way is not going away, I am not sure how it is reasonable to expect that people that as mentioned are mostly volunteers are expected too counter these well funded extreme groups. I will state that I am one of these people, I can assure producers that it is not my intention to implement silly things that will damage the viability of my families stake in this industry when I represent producers as a CCA rep at an external industry committee level. I don’t claim to have all the answers, so I would invite Paul Franks to contact me at anytime to discuss what he believes we need to do too counter the organisations that currently have positions that would possibly affect the ongoing viability of our industry. I am more referring to the likes of the UN for example rather than extremists. The above statements are my own, and not necessarily the views of any organisation I represent. Partner in family beef business. Many producers will not support them because of what they perceive silly things these groups have done in the past. Take CCA for example. Apparently out of the blue, animal welfare suddenly became an “issue”. So what was the response of CCA? It was not to go out and tell these people going on about welfare (which funnily enough I never saw any reasonable person accusing producers of widespread animal welfare breaches) that Australian producers for the most part are doing the right thing. No it was tell all producers they now have to prove via paperwork they are doing the right thing, as if they were all guilty of breaching animal welfare laws prior to the introduction of the animal welfare portion of LPA. This is part of the reason organisations like CCA cop so much flak. They will not stand up for the producer, but rather burden the producer with nation wide poorly thought out paperwork schemes when some ill informed group comes along accusing everyone of doing the wrong thing. Oh and making the producer pay for it as well. Perhaps someone should make a map showing the home address of every politician in Australia. I wonder how quickly the politicians would respond to that before the person who made it was thrown in jail.